Material management is concerned with planning, organizing and controlling the flow of materials from their initial purchase through internal operations to the service point through distribution. In other words, material management is also defined as a scientific technique, concerned with Planning, Organizing & Control of flow of materials, from their initial purchase to destination. 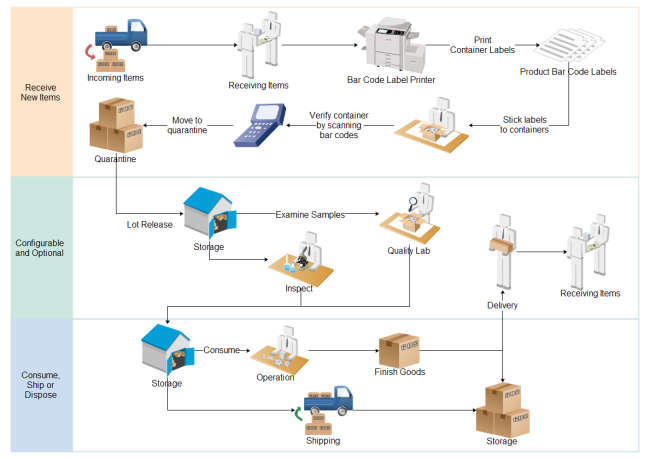 Here is a general workflow diagram showing the main processes of material management. Edraw is an easy workflow tool with auto generation function. 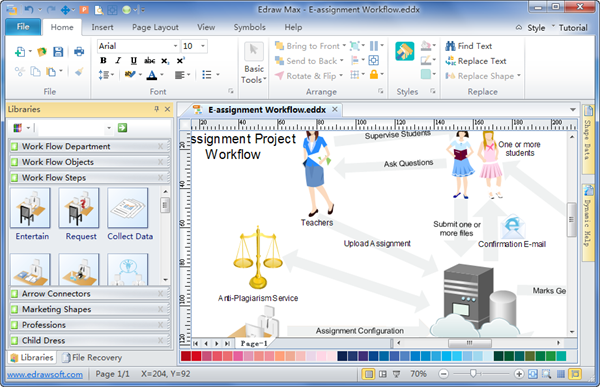 Even novice users can draw workflow diagrams easily and quickly aided by Edraw. It includes smart shapes with floating action buttons, enabling auto connection. All templates and examples are available for free download, which can be transferred into various formats. See its user-friendly interface in the following illustration. Simply speaking, material management is aimed to get: 1. The Right quality, 2. Right quantity of supplies 3. at the Right time 4. at the Right place 5. for the Right cost. To be more specific, organizations expect to gain economy in purchasing while maintaining high turnover; satisfy the material demand for replenishment during a certain period of time; carry reserve stock to avoid stock out; stabilize fluctuation in consumption; and provide reasonable level of customer service. There are four basic requirements to make it effective. 1.To have adequate materials on hand when needed. 2.To pay the lowest possible prices, consistent with quality and value requirement for purchases materials. 3.To minimize the inventory investment. 4.To operate efficiently. Provides maximum supply service, consistent with maximum efficiency & optimum investment. Provides cushion between forecasted & actual demand for a material. Enhances an institutional master plan by filling in the gaps and producing an environmentally responsible and efficient outcome. Offers a more holistic approach to managing vehicle use and emissions, solid waste, hazardous waste, recycling, and utility services which is beneficial for a greener and more sustainable environment. Improve aesthetics, the visual and physical sense of place for those who live and work there by removing unsafe and unsightly conditions, placing core services out of sight, and creating a more pedestrian-friendly environment.